This is the final weekend until Christmas and I can't believe how fast these couple of weeks have gone by. The past few weeks we have been having some snow and this is the first time we are having a White Christmas. I don't recall it have ever snowed just before Christmas. Filling up the stockings is one of my favourite thing to do. I like to fill it up to the brim. I think I might be thinking of getting some bigger stockings... EcoTools has a few products you might like to put in the Makeup Lover's stockings this year. Polishing Facial Cloths is a must have for anyone and everyone. It is made of organic cotton to help remove dirt, oil and makeup. Just washing your face and rinsing with your hands is often not enough. Using the polishing Facial Cloth helps making my face feeling clean and fresh. I worry that my daughter is not washing her face properly so this polishing facial cloths will be very useful for her. The EcoTools Ornament brushes are super cute. You can get a collection of them and hang them on a office Christmas tree with other makeup ornaments. When it is time to bring down the tree, you can all take home the ornaments. This will work if your office is made up of women...or men who wears makeup. They are small enough that they are great for travels or to carry around in your purse. If you are looking for a perfume to give instead, take a look at So...? Fragrance collection. I have noticed this perfume brand at my local Rexall and have always wanted to try it. If you are lucky to find it, the Sheer Illusion set comes with body fragrance spray and the eau de perfum. The body fragrance is a great perfume to carry around with you. It comes in an aerosol spray so you won't have to worry the bottle will break in your bag. It has a pretty sweet scent you can wear all day. It is affordable so you can purchase a few to give and to keep some for yourself. So...? Fragrance Sheer Illusion has a sensual blend of mandarin and bergamot opens up the fragrance, progressing to a floral heart of rose and jasmine, before leaving you with a creamy sandalwood base. Farleyco Markeing Inc would like to offer one of my readers EcoTools Polish Face Cloth and brush ornaments & So...? Fragrance Sheer Illusion set. This giveaway will run from December 23rd, 2017 to January 20th, 2018 (midnight EST). Winner, You have 24 hours to reply. You must be 18+ Open to Canadians only Good Luck! Psst - Can't win if you don't answer the mandatory question. I am not responsible for shipping and handling or damages of the prize. The prize is shipped by the Sponsor and they may substitute the prize depending what is in stock. Your information will be sent to the Sponsor for the purpose of shipping out the prize. *Disclosure - The product in this review was provided to me free of cost for the purpose of conducting this review. All opinions expressed in this review are my own and are not influenced by monetary compensation. From Nova Scotia. Would like to try Polishing Facial Cloths. I'm from Nova Scotia and would love to try the facial cloths! Home Brands EcoTools EcoTools Ramie Bath and Shower Mitt. I'd put this into the camper for when we go in the summer months!! I'm in SK where its snowing because, who doesn't want snow ontop of all that ice, this time of year? I'm from PEI and I'd love to try the Smoothing Detangler Brush! From Ontario. I would like the Blending and Bronzer Brush. 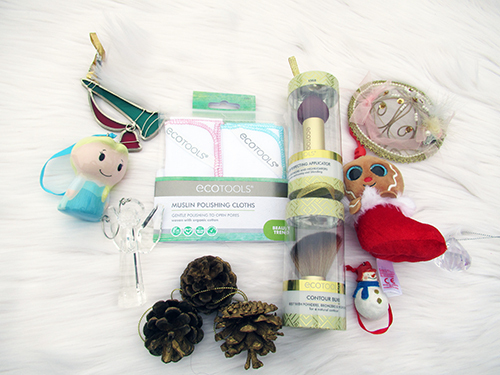 I'm from BC and would love to try the EcoTools Retractable Face Brush! I'm from Ontario and would like to try the bamboo essential eye kit. I'm from Ontario and I want to try the Eco Tools Polishing Cloths. I have their makeup brushes and love them so I'd love to try their makeup removal cloths too! I'm from Ontario and the Smoothing Detangler Brush seems amazing for long hair! I am in Ontario. I would like to try the EcoTools Makeup Brush Shampoo. I am from Alberta and Eco Tools Perfecting Blender Duo would also be great to try. I am from Alberta and would like to try the EcoTools Stippling Brush. This one isn't for me, however I do wish everyone who does enter good luck. I am from Ontario and would like to try ﻿EcoTools Polishing Facial Cloths. I would like to try the EcoTools Six Piece Day to Night Brush Set and I am from Sk. I'm in Ontario. I'd love to try the Pure Complexion Facial Sponge for Sensitive Skin. I am in Alberta. I would like to try the steripod toothbrush protector fro Ecotools. I'm from Ontario and I'd love to try the Smoothing Detangler Brush! I live in NB and would like to try the Smoothing Detangler Brush. I live in Ontario. I would love to try EcoTools Loofah Bath Sponge. I would love to try the "Lash Brow Groomer" I live in Manitoba. I’m from Ontario and would like to try the No Gray Quick Fix.